We know your life is busy and the health and comfort of your family is a top priority. Like you, we all have children to care for, households to run, and many demands on our time. We know how important it is for you to have the peace of mind of knowing your children are only getting pure, clean water when they turn on the tap. 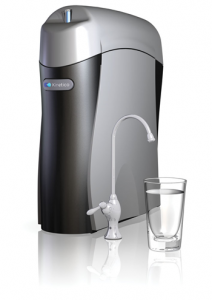 We would like to introduce you to the Kinetico K5 drinking water station. We know the challenges of getting clear water in Minnesota. This compact, reverse osmosis water purification system will save you time and money while ensuring the best water for your family. The Kinetico K5 drinking water station has customizable, multistage filters to meet the specific water purification needs of your household. The first thing we will do is test your tap water to determine what contaminants are present and design your system to eliminate everything in your water that isn’t cool, clear H2O. The system can even be set up to run a line to your freezer so you will not only have clear water from the tap, but your ice cubes will be crystal clear as well. The Kinetico K5 drinking water station features QuickFlo® technology that provides a steady flow when you turn on your tap. You will not have to spend time waiting, or fight with a trickle from the tap when the kids need a drink or you are trying to get dinner going. The EverClean Rinse®, MACguard Filter and PureMometer® filter life indicator makes it quick and easy to keep your system at peak performance. Finally, an appliance that cleans up after itself as it goes along and tells you when it needs to be changed. You can change the filters on your own, or save yourself even more time by having our friendly water specialists, Schultz Soft Water, come out to do it for you. The Kinetico k5 even looks stylish. We will install it either under your sink, or in any other location that is convenient for you and your family. The water comes out of a beautiful, lead-free designer faucet head that we will match to your existing décor. We will do our best to make sure that the only thing you will notice about your new water system is the great taste. We know how much it costs to keep bottled water on hand for your family to use. The average person needs at least a half-gallon of water a day just to drink. That does not count all the other uses like brushing teeth and cooking. Over time, we know that adds up. The Kinetico K5 station is a great alternative, costing just pennies a gallon to operate, and saving you trips to the store to buy more bottled water. It also helps assure your family will stay hydrated. Our kids are finicky. It is hard to get them to drink water that tastes bad or looks funny. The water in central Minnesota often has a rotten egg smell or a cloudy appearance due to decaying bacteria or other particles in the water. We might drink it anyway if we know we need the liquid, but it is nearly impossible to convince our children to drink it. Helping them enjoy clear water out of the tap gives us peace of mind knowing they will not have dehydration related illnesses and there are no water-borne bacteria to make them sick. Best of all, we love knowing we are taking care of the planet as we are helping you take care of your kids. Plastic water bottles fill up landfills and do not biodegrade. Recent studies have shown that elements in the plastic can leach into the water in them over time and are a possible cause of cancer and other illnesses. A reusable personal water bottle or canteen and the Kinetico K5 drinking water station lets you have bottled water purity plus the comfort of being able to take it on the go in a container you know is safe and responsible. As you look for solutions to your family’s water needs, we hope you will let us help. We at Schultz Soft Water take pride in being one of the oldest family owned water treatment businesses in central Minnesota. We have built our business on knowing the challenges you face, because we face them too. Our goal is to bring you the best quality products and services to meet those challenges. We would love for our family to be able to serve your family in all the years to come.